The Victoria Hotel has been an iconic location of Roebourne since 1893 when the hotel, as it can still be seen today, was constructed replacing a small two-roomed thatched house. The public license granted to Simeon Müller on 1 January 1866 under the name Victoria Hotel was the first to be issued in the North West (the second was granted in 1867 for ‘Chinki’ – later the Roebourne Hotel). By 1878 the Hotel was licensed to Charles Zeddi and by 1891 John Spencer was the proprietor of the Hotel. With Spencer at the helm, the hotel underwent renovations. Margaret Porter was the licensee from 1910, until 1914, when the license was transferred to her new husband, Victor Suhard. A cyclone caused major damage to the hotel in 1925, however, renovations were not carried out until 1947. A building permit followed on 11 May 1951, to erect timber-framed bedrooms for staff. Stan Ball took over the hotel’s license in 1953, and remained the proprietor until 1965, when Max McKay purchased hotel from Stan and his wife Jean. In 1966, the McKays built the first block of motel units north of Carnarvon, in order to service the hoards of new workers in the region. The verandahs were not enclosed when the McKays bought the hotel. By 1971, the Victoria Hotel had increased its staff from 13 (in 1969) to 64, due to the rapid influx of construction and mining workers. It became one of the top five liquor outlets in WA. Buses were organized from the work camps and there would be 500 or 600 people crammed into the beer garden, where only jugs, not glasses, were served. The band played on the roof of the outdoor bar. The 1967 Referendum that granted automatic citizenship rights to Aboriginal people were commonly referred to as ‘drinking rights’ because Aboriginal people were permitted to drink in pubs. This had devastating consequences for the community, with alcoholism causing the breakdown of families and increasing abuse and violence. By 1993 Danny Vacca and Libby Bridge were the managers of the now infamous Victoria Hotel. As part of their efforts to renew the image of the pub, the motel section underwent a name change to Mt Welcome Motel. The new owners attempted to revive the Hotel and attract passing tourist trade. They engaged two local Aboriginal men, Anthony Hicks (Noonie) and Patrick Boonga to decorate the outside wall of the hotel/motel area with a mural of Aboriginal scenes and stories. This mural remains today. In 1994 the Victoria Hotel agreed, along with other liquor outlets, to cut morning trading hours as part of a campaign to cut alcohol consumption. The opening time was moved from 6am to 10am, however, the late 1990s saw the closing of the hotel’s doors for good after more than 100 years of trading. In 2013, Yindjibarndi Aboriginal Corporation (YAC) purchased the Victoria Hotel. 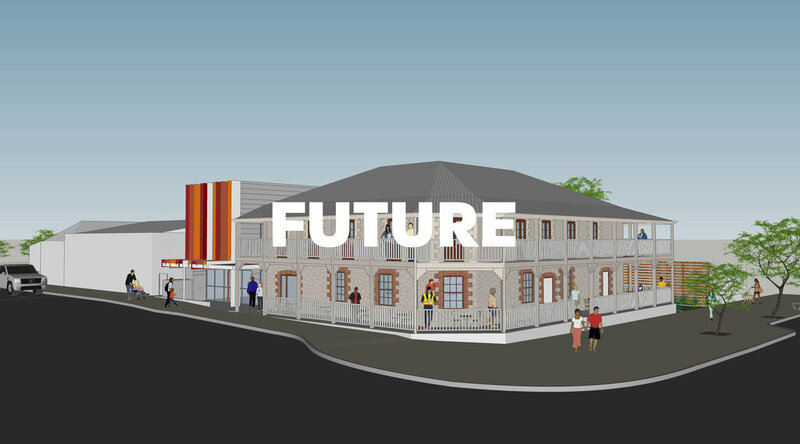 In partnership with local and state economic development groups, YAC hope to return this iconic building to its former glory and transform it into a cultural and commercial hub.